The Precision Press Coffee Maker enhances the simplicity of the French Press brew process through stainless steel construction and an integrated scale & timer to ensure it brews the best possible cup of coffee. Sleek, cordless and compact design reduces clutter. Rich, smooth and full bodied. Retains heat, ensuring proper extraction and best flavour. Integrated scale and timer powered by 2 x AAA batteries. 2 years parts and labour against manufacturer's faults for household use. 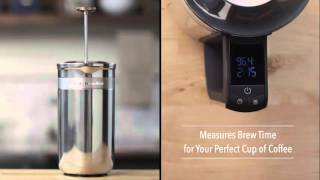 For a quick introduction to the use of your Precision Press Coffee Maker, access the guide below. KCM0512 Precision Press Coffee Maker Stainless Steel is rated 3.8 out of 5 by 4. Rated 1 out of 5 by BlueLake Barista from Looks great, performs poorly I have now owned two of these coffee makers but I certainly won't be owning a third. While the press looks fantastic, sleek, stylish and sturdy, and is very easy to use, clean and maintain, the integrated electronic scale and timer (which for me was the main selling point for the press and the only way its high price can possibly be justified) seems flawed and prone to malfunction, no matter how carefully I clean it and avoid getting any part of the press unnecessarily wet. The electronics shorted out on my first coffee maker within a few months, the second barely three weeks after purchase. While the company is responsive and helpful in their customer service, nothing I try seems to get the electronics working again, leaving me now with two essentially two very expensive standard coffee plungers that I have to augment with separate scalers and timers. Very disappointing and in future I'll be sticking to K Mart over Kitchen Aid - at least you know you'll get what you pay for there. Rated 5 out of 5 by Beeeee from Great coffee every time Makes the best coffee every time. I've switched from a stove top and am loving the coffee and the easy clean.